Defying any doubts that graduating nine players last year would weaken Schechter Westchester’s Boys Varsity Soccer team, the Lions this season advanced further than ever before in Schechter Westchester soccer history, ultimately ending the season as state runner-ups. Ranked first in the league, first in the region and second in the state, some are calling the 2015 SW Boys Varsity Soccer team the best soccer team SW has ever seen. Over the past several years, the Lions have had an outstanding record, making it to the sectional championships every year since 2012. In 2013 and 2014 they were league champions, and in 2012 and 2014 they were sectional champions. At the end of last year’s season, however, some in the SW community and on the team questioned the potential for the Lions’ future success without many of their key players, including SW Hall of Fame athlete, Ari Leffell (‘15). Leffell and Rebecca Landau (‘15) were inducted into the SW Hall of Fame at the end of their SW athletic careers for their soccer achievements; their names are now displayed on the wall in the high school gym. Over the course of the season, team captains junior Noah Dunn, junior Ben Goldberg, and senior Daniel Kohen have been just a few of the many players on the team who have stepped up to fill the void left by the graduated players. Even with that soccer IQ, in order for the team to continue its legacy of success from years past, Lamana had to make some changes. This year the team played a fake offside trap, which is helpful and easy to execute for newer defenders on the team. The strategy tries to trick the other team into thinking the Lions’ defense is trying to catch them offside, forcing the other team to do more work. The new strategy clearly worked, as the team finished the season 13-5-2 and went further in the postseason than any other SW BVS team in school history. Throughout the Lions’ postseason run, the team developed a reputation for last-minute luck, as players often scored with just minutes—and sometimes even just seconds—left in the game, a pattern of resilience, as forward Ogihara played with a broken ankle in the State Finals, and dedication, as the Lions drew support from nearly 100 SW students, faculty, alumni and parents on each administration-organized “Soccerton” (soccer Shabbaton; phrase coined by Director of Admissions Jackie Grosser). Though some saw the Shabbatonim, which were necessitated by the fact that some playoff games are played on Shabbat, as inconvenient, many saw them as key components of what makes this season unforgettable. In the first postseason game, the Sectional Semi-Finals, which took place at Leffell Field at Schechter Westchester, the Lions narrowly beat out Haldane with a 1-0 win thanks to a lone goal by Kohen. At the sectional finals against Hamilton in Arlington, NY, the Lions were down by 1 with less than ten minutes left in regulation time, but Rand scored off an assist from Ogihara to tie the score and send the game into overtime. Ogihara scored the golden goal in overtime to give the Lions a 2-1 victory and their third sectional title in four years. At the Regional Semi-Finals against Southold at Lakeland High School, the score was tied 0-0 for the entire first half and the majority of the second half until Ogihara scored in the 79th minute off an assist from senior Noam Goldberg to beat Southold 1-0. Junior captain Noah Dunn was given the game ball owing to his 12 saves. This was the first time in BVS history that the Lions advanced past the Regional Semi-Finals. 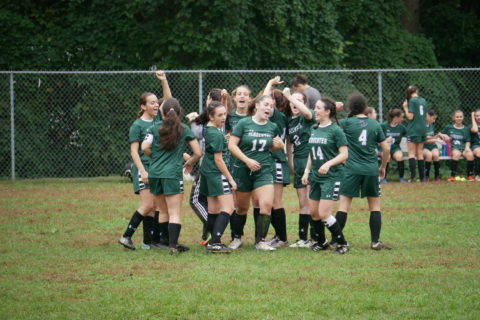 Continuing to make history, the Lions not only became the first athletic team from Schechter Westchester to win a game on Shabbat but also became the first Schechter Westchester BVS team to advance to the State Semi-Finals by winning the Regional Championship. Goldberg again scored the game winning goal, this time early in the second half, giving the Lions a 1-0 lead over Webutuck at Faller Field in Middletown, NY. 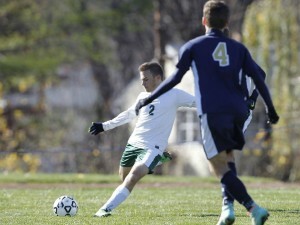 The Lions again came away victorious in the State Semi-Finals by beating the Geneseo Blue Devils at Faller Field following another “Soccerton” at the Howard Johnson. With only 5.4 seconds left on the clock, Noam Goldberg scored on a header off a cross by Ben Goldberg, giving the Lions yet another 1-0 victory, and a first ever BVS Lions appearance at the State Finals. In the State Finals against Elmira Notre Dame, Dunn and the rest of the Lions were under siege from the moment they stepped on the field. Despite Dunn’s 15 acrobatic saves, the Crusaders were unrelenting and ultimately beat the Lions 9-1. Noam Goldberg scored Schechter Westchester’s only goal. Despite their disappointing loss in the state finals, the 2015 BVS SW Lions had a glorious, groundbreaking season. With a new defense setup, a deep understanding of the game, and leaders that can steer the team towards victory, it is no wonder that the Schechter Westchester community is still going crazy over the BVS team. And with all but three starters returning next season, the Lions could very well be back in the State Finals again next fall. The Lion’s Roar wishes a warm congratulations to Lamana and the entire Lions team on their successful season, as well as the best of luck for next season.